More fun than just a barrel of monkeys would definitely be 100 Monkeys! 100 Monkeys is a five piece alterna-funk band out of Los Angeles in which musicians Jackson Rathbone, Ben Graupner, Ben Johnson, Lawrence “Uncle Larry” Abrams, and Jerad Anderson all take on vocal and instrumental duties on different songs in what they’ve dubbed the “switcheroo” during their live performances. Yes, they’re named after the “Hundredth Monkey Effect” (pretty clever if you ask me, seeing as there is no one particular lead singer or one person playing only one instrument for a show’s duration.). They’ve managed to amass a small-but-definitely-growing, loyal fan base due in no small part to Jackson’s visibility – he’s also an actor who appears in many quirky, independent films and tv shows, but his most well-known role is that of Jasper in the Twilight Saga movies. The July 26 Atlanta show was my third time seeing them, and this time, the “third time’s a charm” rule held. And thank goodness, because I was really about to give up on this band! I have to be fair in saying that the previous two times, it was no fault of the band that I had a less than awesome time. They did everything right. Their sets were tight, they sounded good, and were supported all three times by some pretty obscure, but promising new bands you might not have heard of yet. When I saw them at the Wild Horse Saloon in Nashville in November of ’09, Chicago area blues-rockers Tin Tin Can opened. They were a wonderful choice to get the rowdy crowd (of many, many, many teen & tween Twi-hards and their mamas) up and moving and ready for the Monkeys’ performance. I was exceptionally irritated at this show because it took me forever to get parked, forever to get inside the venue, and forever to find a spot about ten rows back. By then, Tin Tin Can’s performance was probably half over. I was also sick as a dog, and didn’t even dare stick around longer than it took me to buy a t-shirt. After leaving, it took me, and this is NO JOKE, from about midnight till 3 in the morning to get out of the parking garage in Nashville. (Okay, so some of that time was spent trying to actually find the garage I’d parked in….but most of it was spent just trying to get out onto the street!) I don’t know what was going on that downtown was THAT crowded, but yikes. I swore I’d never do it again. At the end of December 2010, I did it again. Sick as a dog again. Actually, even sicker. This time, I was headed to Atlanta . The plan was to head over to Laura’s place a day early so that I could attend the in-store signing/meet & greet the band was doing early the next day. On the day I was to leave, I woke up to about six or seven inches of snow, and all roads out of Huntsville closed except for emergencies. I did head on out the next day, the day of the show, and didn’t run into much trouble along the way over. After cabbing it over to the venue, we watched folk/grunge outfit The Kissing Club perform. I liked them a lot, and the Monkeys seemed to be having a lot of fun during their show! But the vibe was so off for me. I also felt so bad I ended up leaving the performance hall before the show was over, and hanging at the bar in front. Once more, I swore I’d never do it again. Obviously, I had a change of heart somewhere along the way. As I said before, it wasn’t the band’s fault I didn’t have a good experience. I think it was just all the other factors surrounding the shows that made me unable to enjoy myself. So the July 26 show in Atlanta rolls around. I couldn’t believe the difference….it was summer, and not cold. I was not sick. The fans were a lot of fun (seriously, I met several really awesome people at this show that I still keep in touch with!). The energy was amazing; and a good time was had by all from start to finish. The Kissing Club opened once again, this time performing a killer cover of The Stooges’ “I Wanna Be Your Dog” in addition to their original material. Also along for the ride were Vancouver, BC natives and southern rockers (yes, I know how odd that sounds, but you really should hear them for yourself) The Bleeding Horse Express. Both bands got great – and well-deserved – reactions from the crowd! The Monkeys, this time out in support of their latest, Liquid Zoo, really outdid themselves. Seems like there was a LOT more interaction with the fans, lots of comedic banter and eccentric dancing, and all the songs we loved, including “The Monkey Song,” “Keep Awake,” “Aim High,” “Ugly Girl,” “Wings on Fire,” “Orson Brawl,” “Reaper,” and a fabulous improv, “Butter My Biscuits.” And we were also treated to a dance-off between a merch guy and the tour manager between sets. 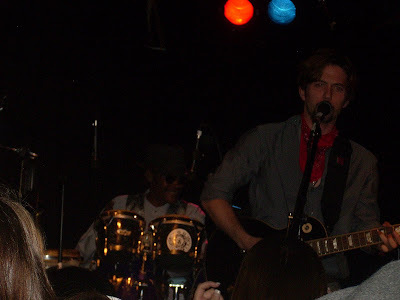 Lawrence “Uncle Larry” Abrams and Jackson Rathbone during 100 Monkeys’ July 26 performance The Loft/Center Stage, Atlanta. For the rest of the photos, go here. 100 Monkeys may not be everyone’s cup of tea, but if you like your music just a bit different, their indie/funk sound (not to mention, a sound that is NOT over-produced into oblivion) might be just what you’re looking for. They’re a young band, but they are good. And getting better with each record. And while the Twilight fanbase has definitely helped the band, it’s also hurt them. I actually think more people would give them, and their music, a chance if they weren’t primarly seen as an actor’s side project. I’ve selected a few of my favorites for a playlist. Let me know what you think in the comments! I keep wanting to do reviews and stuff objectively. But I give up on the concerts. I don’t know enough about any technicalities to review from that standpoint, so if a band I love puts on a good show, then I’m happy. I’ve taken to just calling these concert pieces “my experiences” instead of reviews. I actually wanted to go more in-depth about not being so impressed with the first two shows, but left that out mainly due to space and the fact that I really didn’t find fault with the performances themselves. LOL. Most of what I like is not anyone else’s cup of tea. Thanks for commenting! Never heard of ‘em. Not a ‘Twlilight’ fan so not sure who the dude is. But oh, those opening guitars on “Ugly Girl” are the key to my heart. Nice post! Thanks for commenting, Mari! Now ya know, LOL!